Here we have a delightful little Morris Minor Convertible Built in 1957. This morris is in Fantastic condition, not far from concourse, It was completely restored only a few years ago. It has covered 46,000 miles and is thought to be accurate. The vendor has lot of paperwork with the vehicle and all previous MOT’s since his ownership began 8 years ago. It has red interior and a rather smart red Vinyl roof to match. It is a genuine convertible not a conversion. 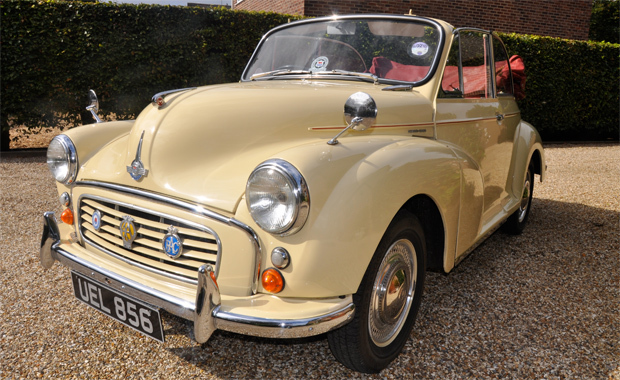 The Lovely Morris has only covered 3,000 miles in the last 8 years and has been dry stored when not in use. In these past 8 years it has not seen a drop of rain and has only ever been driven in fair weather. It has a current MOT and is Taxed . It is a historic vehicle – which means it is TAX Exempt. In November of this year it will also be MOT exempt. A new law has passed in which it states all vehicles pre 1960’s will not require a MOT to be driven on UK roads. Overall this is a tremendous opportunity to owner a original Morris minor convertible in what we think is show condition. It has been very well looked after and has always been regularly serviced. It turns heads wherever it goes and is now looking for a new loving owner.